Odessa-Montour High School juniors Kennedey Heichel, left, and Olivia Grover. ODESSA, May 27, 2018 -- It is time once again for an annual rite -- the unveiling of the Top Drawer 24 team. This is the 13th such team, and this year it is dominated again by seniors. Once again, 10 schools are involved: Watkins Glen, Odessa-Montour, Trumansburg, Spencer-Van Etten, South Seneca, Elmira Notre Dame, Horseheads, Elmira, Thomas A. Edison, and Twin Tiers Christian Academy. The Top Drawer honorees from those schools were selected by a committee and through consultation with administrators, teachers and coaches. The Top Drawer program continues to maintain tradition by considering anyone in grades 9 through 12 as eligible for consideration. However, no freshmen made the team this year, nor in the previous 11 years. While sophomores are occasionally represented, none was on the team the past three years, nor is one this year. There are 16 seniors and 8 juniors among this year's honorees. Committee members, in considering potential honorees, took into account academic accomplishments, achievements on the playing fields, and the ability of the students to engage the world through civic endeavors or to leave behind them positive consequences from their positive actions. The team will be honored on Monday, June 4 at the Watkins Glen State Park pavilion (near the south entrance). A social hour begins at 5:00 p.m. The weather won't alter the locale, since the site provides shelter. Finger foods and beverages will be provided in a setting prepared by local school and park officials. A traditional highlight will be a team picture taken outside the pavilion by this website and by any parents who wish to do so. Speakers during the ceremony will include Warwick Valley Schools Athletic Director (and multiple Hall of Famer) Gregory Sirico, mountain climber Doug Duncan, and former Top Drawer honorees Erin and Mia Strollo, graduates of Horseheads High School. (More about the speakers can be found at the bottom of this page.). Emcee for the evening will be Renata Stiehl (pictured at right), news anchor on WENY-TV. She will, near the end of the ceremony, introduce the honorees one by one, describing their accomplishments. Each will receive a medallion and certificates of achievement from government representatives. When we unveiled the first such team 12 years ago, we did so in a low-keyed fashion, announcing its members publicly only after a party honoring them was held. Since those early days we have announced the selections before the party, and are doing so again this year in order to encourage attendance by friends, relatives and coaches of the honorees, as well as attendance by administrators, School Board members, area dignitaries and the general public. The honorees are encouraged to bring as many people with them to the celebration as they wish; there is no limit, and there is no charge. Awards for the Odessa File Male and Female Athletes of the Year at the Watkins Glen and Odessa-Montour High Schools -- plaques sponsored by the E.C. Cooper insurance firm -- will be presented before the Top Drawer ceremony begins. And as in recent years, the annual Susan Award will be presented as part of the evening's ceremony. The award is named after Odessa File editor-publisher Charlie Haeffner's late wife, Susan Bauman Haeffner, and is presented each year to a student-athlete who embodies sportsmanship amid life's adversities -- who possesses a core of kindness that co-exists with an unswerving drive to succeed. Past winners have included Sally Wilcox, Courtney Warren, Sophie Peters, Ian Remmers, John Blaha, Devon Shaw, Sam Richardson, Ashley Tieppo, April Ruda, Nicole Colunio, Felicia Johnson, Megan O'Dell, Joe Collins, Lucy Craig, Brewster Marshall and Nakiaha Robinson. This year there will be two Susan Awards presented -- to two very different and yet wholly deserving individuals who Haeffner says "will honor the award as it honors them." From left: Watkins Glen High School's Ryanna LaMoreaux, Hannah Morse, Isobel Scheffey and Kai Sutterby. Isobel Scheffey is a Watkins Glen High School senior with a 93 grade-point average who competes in soccer, indoor track and track -- and was an Odessa File All-Star in all three. She set school records this year at several Indoor Track distances, and set a school record in the outdoor 400 Meters at the IAC championships as well as winning the 200. A captain of the soccer and track teams, she is a member of the National Honor Society and Student Council, is the Art Club treasurer, and has participated in Yearbook Club and Varsity Club. She has volunteered for Arc spaghetti dinners, Live Like Liz, Kids Night Out, and Kickball for a Cause, and has done After School Tutoring. She plans to attend the University of Albany in the field of Human Biology, with an eye toward possibly competing in track. She would like to become a pediatrician. Ryanna LaMoreaux is a Watkins Glen High School senior with a 99 grade-point average who has been a member of the National Honor Society, Debate Club, Varsity Club, Art Club and Rotary Interact. A High Honor student each year of high school, she has competed in soccer, basketball and track, was on the state championship basketball team in her junior year, and played a key role at shooting forward as the basketball team reached the Section IV final this year. She was an Odessa File All-Star this year in both soccer and basketball. She has volunteered extensively, serving at Arc Spaghetti Dinners and Thanksgiving church meals, helping with the Seneca Santa program, mentoring, and coaching Saturday youth basketball. She plans to attend Lycoming College in Pennsylvania, where she has received a scholarship and will play basketball, and is looking toward a career in the law, in private practice or as a District Attorney. Hannah Morse is a Watkins Glen High School junior who excels at soccer (striker and team MVP), basketball (point guard) and tennis (first doubles). She scored the state championship winning points in the Class C basketball title game in 2017, and was named to the all-Section IV basketball team this year after her Senecas reached the sectional final. She was The Odessa File Schuyler MVP for her soccer exploits in the fall, is an Odessa File All-Star in all three sports, and is this year's WGHS Female Athlete of the Year. A member of the National Honor Society, she has consistently been a High Honor Roll student. After earning 7th Team All-State in basketball in her sophomore year, she was captain of the basketball team this year -- making the Hoops for Hospital All Tournament Team, earning the Melissa B. Wilson Holiday Tournament MVP award, and serving for the fourth year as a coach during Saturday morning youth basketball. She is undecided about which college to attend, but hopes to play basketball or soccer when she gets there. Kai Sutterby is a Watkins Glen High School junior who is ranked third in her class with a 100 grade-point average. She has been in the top 10% of her class the past three years, and is notable for having started an inter-district school clothing drive program designed to benefit students around the region. She is a Student Council representative and a member of the National Honor Society, Varsity Club and Interact Club, and was a key speaker at the recent annual meeting of the Schuyler County Partnership for Economic Development -- urging development not only in tourism, but in other business, as well. As a member of the school's cross country team, she has qualified for the State Tournament three times, consistently earning Odessa File First Team All-Star status -- and competes in distance races on the track team. She will be applying in the fall to colleges, and hopes to become a surgeon "and help change lives." Left: Twin Tiers Christian Academy's Sarah Proper. Right: Spencer-Van Etten's Mackenzie Grube in the school library with the S-VE mascot and the plaque listing Top Drawer 24 honorees from Spencer over the years. Curtis Harris is a senior at Odessa-Montour High School, where he is ranked sixth in his class with a 92 average, and has been a standout in soccer (a forward), basketball (point guard and shooting guard) and tennis (first singles) -- earning IAC and Odessa File All-Star status in each. He has also participated in karate for six years, earning 1st Degree Black Belt. Among his sports awards this year were Addison Basketball Tournament MVP, the ESPN Ithaca Athlete of the Week, a basketball Sportsmanship Award, and Odessa File Athlete of the Week in both soccer and basketball. He was also named the Odessa-Montour Male Athlete of the Year by The Odessa File. A recipient of the Elmira Key Award, he plans to attend Elmira College, where he will play basketball and tennis, and "figure out what I want to do in life." Billy Tague is a senior at Odessa-Montour High School, where he carries an 87 grade-point average and has been a member of the soccer, swimming and tennis teams. He has won three Section IV swim titles, including two this year -- in the 200 Yard Individual Medley and the 100 Yard Breaststroke, earning The Odessa File's Schuyler Winter MVP Award. A member of Interact Club and a youth swim instructor, he has been an IAC swim All-Star for five years, won the EFA Invitational's Breaststroke title this year, and led his team to the EFA tournament Class C title. He has also won a Coach's Award in tennis, and he finished second at the recent IAC tennis championships in singles. He plans to attend Hartwick College on scholarship, where he will compete in swimming. He would like to become a sales manager or manage a pharmacy. Kennedey Heichel is an Odessa-Montour High School junior who is No. 1 in her class academically with a 98 average, and competes in soccer, basketball and track. She was an IAC First Team All-Star in soccer (where she plays forward), a guard on O-M's division-winning basketball team, and The Odessa File Schuyler Spring Co-MVP for her track exploits, as well as its O-M Female Athlete of the Year. A consistent winner this spring in the 100 Meter Hurdles and 400 Meter Hurdles and the 4x100 Relay, she set a school record in the Pole Vault and helped lead her team to a division title -- and later became Section IV, Class D champion in the 400 Hurdles and Pole Vault. She is on the Superintendent's Leadership Team, and a member of the National Honor Society, Student Council (vice president and treasurer) and Interact Club. She plans to attend college and compete there in track, and is looking toward a career in medicine. Olivia Grover is an Odessa-Montour High School junior who is ranked 11th in her class and is a member of the National Honor Society and the Superintendent's Leadership Team. She was an IAC Divisional basketball MVP this past season as she averaged 15 points per game and led the Indians to a division title. She was an Odessa File First Team All-Star in basketball, was twice its Athlete of the Week, and was honored by WETM-TV and ESPN Radio for her achievements on the court. She also is a strong presence on the soccer field, where she plays midfield on a team that won the IAC championship two years ago, and she competes in AAU basketball. She hopes to attend a Division 1 school and play basketball, and is looking toward a career in pediatric medicine. From left: Trumansburg's Jacob Shelley; Edison's Hunter Farley and Olivia Thresher. Sarah Proper is a Twin Tiers Christian Academy senior who carries a 4.0 grade-point average and is a member of the National Honor Society, the New Visions Honors Academy, and the Student Leadership Council. She is part of her school's Choir and Orchestra, and is the Worship Team pianist. She won gold at a Family Community and Career Leaders of America job interview competition, and is Class Valedictorian. She has played soccer (sweeper) and basketball (shooting guard), and was the soccer team's MVP the past two seasons (it won the league title this year) and a NYPENN League All-Star for three years. In basketball, she was a NYPENN League All-Star for two years. She has participated in a Serve-a-thon for four years, and in a program that teaches conflict management to elementary students. She is employed at Giuseppe's Restaurant, and plans to attend Corning Community College, where she might play soccer. She plans to teach Secondary English, and English as a second language. Nick Noteboom is a Twin Tiers Christian Academy senior who carries a 3.51 grade-point average and is a member of the National Honor Society, vice president of the National Technical Honor Society, and a participant in the Criminal Justice program at GST BOCES. He has played basketball and soccer, was captain of both teams, is a three-time basketball All-Star, and has been named a soccer All-Star on defense. He has served with and for the People's Baptist Church, participated in Cops, Kids and Toys with the Cornell Police Department, and helped with campus open houses on the GST BOCES Bush Campus. He plans to attend Corning Community College and possibly play basketball there. He is currently employed as a security officer at the Corning Museum of Glass, and is looking toward a career in law enforcement. Isabel Milazzo is an Elmira Notre Dame High School senior who carries an 89 average and plays softball, basketball and tennis -- excelling in particular on the softball diamond, where she earned First Team All-State honors last year as her school was ranked fifth in Class C with a 21-1 record. She was on three straight softball sectional championship teams, a state championship team in 2016, and the state runnerup squad the year before. This year Notre Dame, despite losing seven regular-season games and earning a No. 6 seed, advanced to the finals of the Section IV, Class C tournament behind Milazzo's pitching and hitting. An Honor Roll student, she is a member of Key Club and Go Green, and has helped kids learn to pitch, worked in a soup kitchen, and tutored. She won the Junker Johnston Softball Award in her junior year -- presented to the top softball player in Chemung County -- as well as a Sportsmanship Award. She plans to attend Onondaga Community College, play softball there, and pursue a career in business administration. Olivia Thresher is an Edison High School senior who carries a 98.94 grade-point average and is valedictorian. She has played varsity volleyball (as a middle hitter) for three years and varsity tennis (doubles) for five years, earning the Brad Sanford Award in tennis and IAC All-Star mention in volleyball. She is a member of the National Honor Society and the National Technical Honor Society; is Class President, Key Club president, and secretary of the Junior Rotarians and Student Council; and participates in a church youth group, teaches youth tennis, and organized a JDRF fundraiser in honor of her father. She has received the DAR Good Citizen Scholarship, an Everyday Hero Award, and Edison's Student of the Year Award. She plans to attend SUNY Cortland with a Presidential Scholarship, major in Early Childhood Education and play intramural tennis. She hopes to become a kindergarten teacher in a high-needs school. Elmira High School's Alexus Boorse (left), Zack Middaugh and Emily Saltsman. Hunter Farley is an Edison High School junior who carries a 91 average and is a member of the National Honor Society and Key Club -- and is a licensed glider pilot, working on obtaining a powered-plane license. He has worked at the Food Bank, and volunteered at Harris Hill. He competes in varsity football as a wide reciver and safety, and in varsity tennis as a 2nd Singles player. He was named to the Elite 24 football team, was on the All-Section 4 Football First Team, and was All-IAC in tennis -- and in his freshman year was the IAC champion in 4th Singles. He hopes to attend either St. John Fisher or Penn State and play football and tennis, and will pursue a career as an Air Force pilot. Skylar Shaulis is a South Seneca Central School senior who is a High Honor Roll student with a 97 grade-point average and ranked No. 1 in her class. A member of the National Honor Society, she has participated in local blood drives and, as a member of the Mural Club, helped create a mural for a community garden. She has competed in soccer (as a sweeper), basketball (as a guard), softball (in her junior year) and track, and was on the school basketball team that has won three straight Section V titles and won a state championship in 2015-16. She was Section V basketball MVP in 2016-17, and received a Section V basketball Sportsmanship Award in 2015-16. She plans to attend Alfred State, where she will play basketball, and is seeking a career in nursing. John Zajac is a South Seneca Central School senior who has been a High Honor Roll student throughout high school, and has competed in golf, basketball as a power forward, and baseball as a centerfielder and pitcher. He has been a golf MVP and First Team All-League selection, and a two-time MVP in baseball, where he has received all-league, all-area, and all-State honors. Recipient of an Aristotle Award for Biology, he has participated in Marching Band and Drumline. He plans to attend Ithaca College, where he will play baseball. Upon graduation, he plans to work with and around athletes. From left: South Seneca High School's Skylar Shaulis and John Zajac; Twin Tiers Christian Academy's Nick Noteboom. Emily Saltsman is an Elmira High School junior who carries a 99.92 grade-point average and is ranked fourth in her class and has been an All-STAC Academic honoree for four years. She has also received the Finger Lakes Scholar Award. She has played varsity softball (as a shortstop) for five years and varsity volleyball (as a libero) for two years, and competed in indoor track as a sprinter for one year. She has been an All-STAC selection in softball, and a member for six years on the Lady Rebels traveling softball team. She has volunteered for a backpack supplies drive and a peanut butter drive, and has helped at Elmira Express softball and volleyball camps and in the Challenger sports league. She is undecided on a college, but wants to play softball or volleyball at that level. Her career goal is to become a psychologist. Zack Middaugh is an Elmira High School junior who carries a 99.49 grade-point average and is ranked fifth in his class. He is a member of the National Honor Society, is a Finger Lakes Scholar, and had the highest academic average among male athletes in his school last year. He plays quarterback and cornerback on the varsity football team, which has won a sectional title, and forward on the basketball team. He has volunteered for Food Bank and at nursing homes, read to elementary students, helped at Express sports camps, and helped the Post Office with a food drive. He is undecided about which college to attend, but wants to go for veterinary studies with an eye toward a career as a veterinarian. Alexus Boorse is an Elmira High School senior who carries a 90 grade-point average and is a member of the National Honor Society. She is a three-time STAC All-League selection in soccer, and a two-time All-Division basketball player. She received the Coaches Award in both soccer and basketball in 2017, and was MVP for the Soaring Caps soccer team and recipient of a Kiwanis athlete award for basketball. She has worked at Elmira Express sports camps and at Express concession stands, and has signed to play soccer at the Division 2 College of St. Rose in Albany. She is looking toward a career as a pediatrician or in Sports Surgery. From left: Odessa-Montour's Curtis Harris, O-M's Billy Tague, and Notre Dame's Isabel Milazzo. Milazzo's face paint was from a carnival that day at school put on by her class raising funds in support of Down Syndrome research and treatment. Mackenzie Grube is a Spencer-Van Etten senior who carries a grade-point average of 99.65. She is a member of the National Honor Society, and has been Student Council Treasurer since 2015. She has competed in varsity soccer, basketball and track, serving as captain on all three teams, and has participated in Yearbook Club, Quiz Team, ARMS (Athletes as Role Models), Senior Band, and Saxophone Quintet. She is CPR Certified; has worked with children in Spencer and Van Etten, preparing meals for them and reading to them; has served as chaperone at elementary and middle school events; has helped senior citizens, serving food and talking to them, and playing bingo with them; and has coached youth basketball. She was a two-time division MVP in soccer; an all-regional basketball All-Star; and holds the school track record in the 800 Meter Run. She plans to attend SUNY Brockport in the fall and major in Physical Therapy and Athletic Training, and is interested in a career as an Athletic Trainer for various sports teams. Jacob Shelley is a Trumansburg senior with a 94 grade-point average -- a High Honor student who is a member of the National Honor Society and has participated in Drama Club, Jazz Choir, Culture Club and Adventure Club, and is a member of the High School Chorus. He has competed in soccer, basketball and -- for four years -- on the varsity baseball team as a pitcher and first baseman. He has been on two IAC baseball championship teams, been an IAC First Team All-Star for four years, an was ESPN Pitcher of the Year and a 2nd Team All-State baseball honoree in 2017. He operated a school sports newspaper for two years, created a YouTube channel with interviews of Trumansburg athletes, has been a member of Students against Destructive Decisions, and has played on a band that raised funds for non-profit entities. He plans to attend Ithaca College, where he has a Rod Serling Scholarship for Communications. His goal: to work as a radio or TV broadcaster in sports, preferably baseball. Alli Richmond is a Horseheads High School senior who carries a 97.21 grade-point average and is ranked in the top 10% of her class. She has been captain of the varsity basketball team, its MVP twice and All-Conference; and captain of the softball team, earning MVP and All Division honors and twice making the All-State squad. She has played on a Section IV championship basketball team and a STAC championship softball squad. She is a High Honor Roll student, a STAC Academic All-Star, and a member of the National Honor Society, New Visions Honors Academy, the National Technical Honor Society and Interact Club. She has served as a Golf Camp and Softball Camp instructor and as a volunteer for the Food Bank of the Southern Tier. She has committed to attend Binghamton University and play softball there, and is eyeing a career as an Actuary. From left: Horseheads High School's Abby Clark, Alli Richmond, Michael Limoncelli and Nathan VanBrunt. Abigail Clark is a Horseheads High School senior who carries a 91.57 grade-point average and is a member of the National Honor Society, the National Technical Honor Society, Varsity H Club, Interact Club, Student Council, and the New Visions Honors Academy. She has worked in youth sports camps and Coaches vs. Cancer clinics, been a Salvation Army bell ringer, volunteered at the Food Bank, and taught Conflict Mediation to elementary students. She plays defense in soccer and small forward in basketball, was captain of both teams, and has earned three varsity letters in each sport. She has won the All STAC West Defensive Player Award in soccer, and the Basketball Coaches award the past two years, and was on the Sectional Championship basketball team two years ago. She plans to attend SUNY Cortland to study Early Childhood Education. Nathan VanBrunt is a Horseheads High School senior who carries a 91.94 grade-point average and is a member of the National Honor Society, the National Society of High School Scholars, the National Technical Honor Society, Varsity H Club, and the New Visions Honors Academy. He competes in basketball, lacrosse and golf, and is captain of all three teams. A Corning Credit Union student intern, he referees youth basketball, and helps with Horseheads youth lacrosse and Challenger Baseball. His teams in each sport -- basketball, lacrosse and golf -- won sectional titles in 2016, and he has earned nine varsity letters. He plans to attend Limestone College under scholarship, play lacrosse there and study finance with a career goal of owning his own financial advisory firm. Michael Limoncelli is a Horseheads High School junior who carries a 3.4 grade-point average. He is a shortstop and pitcher in baseball and a shooting guard in basketball, playing on a basketball sectional championship team in 2016 and a baseball sectional championship team in 2017. His baseball team was also the STAC champion in 2016. He earned 4th Team All-State status in baseball last year, as well as All-Conference, and has verbally committed to play baseball at the University of Pittsburgh. He has worked at youth sports camps and at Coaches vs. Cancer clinics, and volunteered at St. Mary our Mother's. He would like a career in Professional Baseball and Sports Administration. That's all of them -- two-dozen notable people who share at least one thing in common: by excelling in unique and impressive ways, they have earned the admiration of the selection committee and a seat on this team. They have successfully embraced many athletic, academic and social opportunities in high school, and thus prepared themselves for life's many challenges. Gregory Sirico is employed by the Warwick Valley Central School District (near New York City) as Athletic Director and Head Football Coach. Under his direction, the Wildcats have won multiple division titles and sent over 100 student athletes to college to continue their education and pursue NCAA football careers. Coach Sirico is a member of the New York/ New Jersey High School Football Coaches Hall of Fame (for 12 years of service enhancing high school football in those states), the SUNY Cortland C-Club Athletic Hall of Fame, and the Warwick High School Hall of Fame. Born April 7, 1967 to Carol and Gregory Sirico, he is the oldest of six children. Following graduation from Warwick High School, he attended Cortland State, earning a degree in Mathematics and Physical Education while playing football under the guidance of Coaches Craig Cheplick, Dennis Kaiser and Dave Murray. During those four years the Red Dragons compiled a record of 34-6 and made three consecutive NCAA appearances, including a run at the National Title in 1988. (Cortland State finished with a perfect 10-0 regular-season record, and an 11-1 record overall.) Sirico served as football captain and graduated as an All ECAC Receiver with five school records. He returned to his alma mater, Warwick, as a teacher and coach in 1993. He has served as the school's director of health, physical education and athletics since 2007, and has been the head football coach from both 1996-2005, and 2013-present. He says he finds the most joy in serving his community and young people. He is past President and Executive Board member of the New York State High School Football Coaches Association, a Wounded Warrior Project Coordinator, and CEO of the Purple Champions Club that has donated over $100,000 to Youth Activities Programs with a mission of character development through athletic participation. He is the Clinic Director for the NYSHSFCA that serves over 1,000 New York State Coaches. Sirico resides in Warwick, New York with his wife, Lori Sirico, and three children -- Gregory (17), Dominic (14) and Julia (14). Doug Duncan, 50, has a long history of motorcycle and motocross racing, and extensive experience in climbing mountains in the Adirondack range. Duncan, of Elmira, was operating street and ice-racing motorcycles by the time he was 16, graduated to large street racers by 21, and won his first Motorcycle Road Race at 25 -- after sustaining a back injury a couple of years earlier playing hockey. More victories came as the years progressed, as did another injury -- a compound fracture of a wrist that temporarily ended his Road Racing. He entered motocross racing after that, tried his hand again at Road Racing, then retired from racing at 32. He later took up long-distance bicycle riding, for example riding annually on a 94-mile excursion to Sodus Point, NY. Then, at age 41, he discovered hiking, which became a passion. 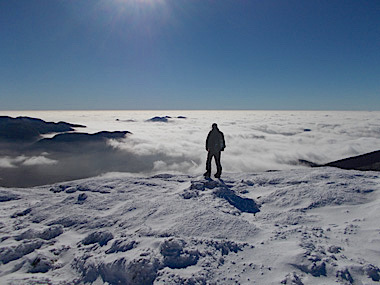 He tackled the Adirondack Winter 46 -- climbing the 46 peaks of the Adirondacks in a single winter season. Says one website: "Only those who are in excellent physical condition properly equipped and skilled in winter techniques should attempt this." At the age of 47, he hiked the Catskills extensively, and at 48 and 49 biked "to an extreme." At age 50, he completed his 10th annual Sodus Point bicycle ride, completed his second round of the Winter Adirondack 46, became the fifth person to complete the NEU8 (Northeast Ultra) Summer climbs (hikes on eight challenging paths, trails and ranges), and, with hiking partner Jim Wallace of Mountain Venture Guides, completed the Cranberry 50 (a 50-mile trail around Cranberry Lake that includes mountains, ponds, rivers and other wilderness features) in under 24 hours -- something never done before. Meanwhile, he and Wallace worked pets into the equation by forming Peaks for Pets -- raising money for the Chemung County SPCA by encouraging pledges tied to their achievements on the hiking and climbing trails. Sisters Erin and Mia Strollo -- both student athletes at Nazareth College -- were members of the Top Drawer 24 while students at Horseheads High school, Erin in 2014 and Mia in 2016. Erin (pictured top right) has played soccer at Nazareth for four years, including as captain. She has been a defensive mainstay for the Golden Flyers, earning Empire 8 Conference all-star honors and All-East Region honors from the National Soccer Coaches Association of America. While in high school, she was a standout in soccer, basketball and lacrosse, helping the soccer and basketball teams to three league titles each and the basketball team to four straight Section IV titles. She was named Horseheads High's Female Athlete of the Year in 2014. 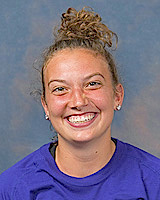 Mia (pictured bottom right), a nursing major, played soccer at Nazareth for the second straight year this year after a rookie season that saw her play in 19 games. While in high school, she played five seasons of varsity soccer, and also excelled in basketball and lacrosse. Like her sister, she was named Horseheads' Athlete of the Year, the award coming in 2016. Her soccer honors included all-state status, team MVP and first-team Southern Tier Athletic Conference all-star. The Lifetime Achievement Award recipient at the Top Drawer 24 party, Ben Cardamone, is a longtime and highly successful cross country and track-and-field coach in the Elmira City School District. The honoree this year, Ben Cardamone "represents this award perfectly with a career featuring success, longevity and integrity spanning three decades," says Craig Cheplick, co-founder and chairman of the Top Drawer 24. Cardamone began coaching Cross Country and Track & Field in the Elmira City School District in 1985. 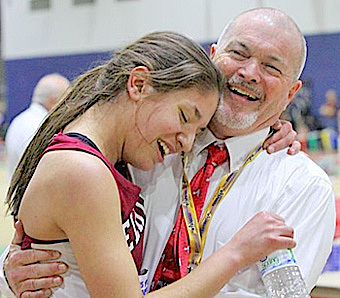 A teacher at Ernie Davis Academy, he has taken individuals and teams to both state and national races -- including Abbey Wheeler, a Top Drawer 24 honoree in 2016 and pictured at right with Coach Cardamone. She was an All-American in both Cross Country and Track, and earned a full athletic scholarship at Providence College. Cardamone served for years as an assistant coach on hugely successful Elmira Cross Country and Track & Field teams, and as head coach has rung up multiple Southern Tier Athletic Conference, STAC West divisional and Section IV titles. His girls Cross Country teams won sectional crowns each year from 2002 to 2006, and the boys cross country team was a titleist in 2005. He is currently head coach of Elmira's boys and girls Cross Country teams, its Indoor Track team and the girls Spring Track squad. Cardamone has been the STAC and Section IV track coordinator since 2003 and continues in that role. Photo in this section: Honoree Ben Cardamone with Abbey Wheeler, a Top Drawer 24 honoree in 2016 and now at Providence College.